Three dishes in one day, not counting the cookie dough I made today and will be baking tomorrow night - stay tuned. This was the easiest of the three. I only used 2 1/2 lbs of ribs instead of the 5 lbs the recipe called for since I couldn't imagine eating 5 lbs of ribs but I did make the full recipe of the sauce. I made the sauce first thing this morning and let the ribs marinate in it for about 8 hours. The recipe says to bake the ribs for 40 minutes but at 40 minutes, they still seemed pretty tough. My mom makes ribs that come out fork tender and I know she said she bakes them for a long time. I ended up baking these for about 2 hours. They're still not as tender as I could've wished but the sauce was really delicious. Next time I may try making these in a crock pot with boneless ribs and let them get tender that way. I used my mom's trick of lining the roasting pan with foil. When you bake the ribs on the wire rack in the pan, some of the marinade/basting sauce drips into the pan and caramelizes then burns, especially when it's in the oven for 2 hours. But with the foil lining, all you have to do is peel it off and throw it away. Minimal scrubbing needed for the roasting pan. I basted this every 10-15 minutes. I probably could've left the ribs in the oven longer than 2 hours to tenderize them even more but I'd run out of marinade to keep basting with and I didn't want them to dry out. 1. Cut the lengths of ribs in half. Combine the tomato puree, sugar, Worcestershire sauce, vinegar, chili powder, paprika and garlic in a large non-metallic bowl. Add the ribs and coat well with marinade. Cover and refrigerate for 2 hours or overnight, turning occasionally. 2. Preheat the oven to 400˚F. Place the ribs on wire racks in two baking trays, reserving the marinade. 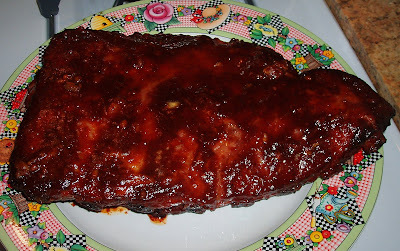 Bake the ribs for 40 minutes, or until well browned, brushing frequently with the marinade. Serve with crispy roast potatoes and a green salad.